Asha Villa in Pune is full of all the space, natural light, custom-made accents, and Italian marble flooring as befits a contemporary luxury residence. All credits go to Veekas Architectural Studio. The family brief asked for a large house, with an ample garden which could frequently host social gatherings. Fairly simple demands of a future abode. But Veekas Architectural Studio took this wish and spun out a home eminently modern and spacious, but yet warm and welcoming, a combination achieved through careful segmentation of spaces and smart placement of art pieces and statement features. This residence in Pune is approached from a pedestrian ramp which is laid along a water-body holding lotus plants and fish. The lovely garden can be independently accessed from this entrance ramp. 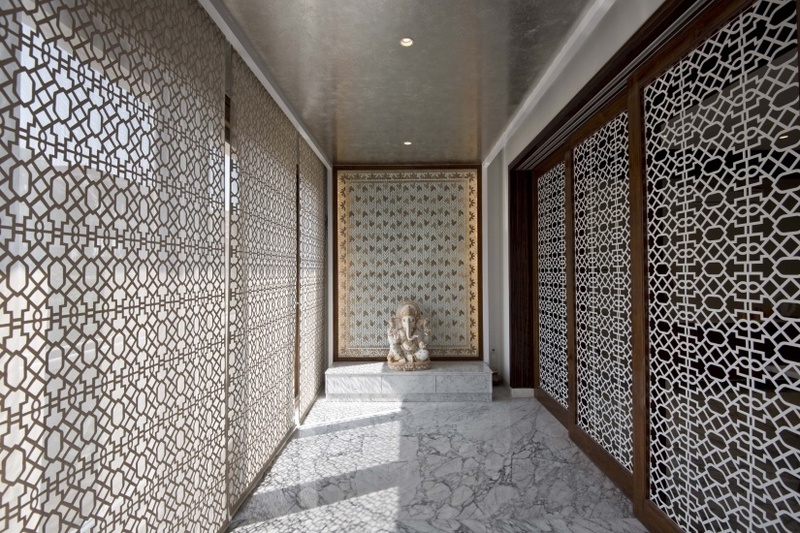 The entrance wall, clad in warm-hued onyx stone welcomes visitors and hints at the opulence of the interiors. The next eye-catcher is the lobby. A large round glass inlay in the floor here has been spot-lit to direct all eyes to its elaborate pattern and the plush materials. A lotus wall-art, an aquarium, and large flower vases together create the welcoming aura of this section. The large formal living room stands 16 ft. high, with full-height motorised sheer drapes covering all large openings. This means plenty of natural light within the house, thereby greatly reducing the use for artificial lighting. A bespoke chandelier, champagne leafing on the false ceiling, customised glass doors with etchings, and rich wallpaper draping add to the luxury quotient of this room. The pool is a marvel in this split-level home. “The swimming pool has triple height, which allows all the different spaces to overlook its volume and helps in the visual connectivity of the spaces,” states Kalpak Bhandari of Veekas Architectural Studio. The customised ceramic lotus mural on one wall here seems to rise from the infinity edge of the pool and colourful ceramic fish seem to jump from the water. “This area is the heart of the residence,” affirms Bhandari. The entrance lobby, formal living room, dining area, and kitchen with storage and utility areas have been planned at the entry level. A staircase leads to a semi-basement, which houses the private areas, office, home-theatre, an informal party area, and a gymnasium. The master bedrooms are situated on the first and second levels and overlook the pool. All the bedrooms have a sleeping, reading and TV-zone, along with walk-in wardrobes and large toilets decked in Italian marble. “A cantilever sits out to one of the master bedrooms, projecting over the pool. It is clad with mirrors all around to reflect the pool water, murals and the surroundings, thus diluting the physical existence of the sit-out,” states the design team. The family room terrace has been finished with a combination of composite wooden flooring and rustic vitrified tiles. White Statuario Marble flooring spans across all the day areas, and beige-coloured Italian marble has been used in all the bedrooms and family areas. This effect is complemented by walnut and ebony veneers of the doors and the door-frames. Asha Villa is a true monument of elegant and accessible luxury. There are no un-welcoming tones in this home.